There are many bus companies that travel from Singapore to different destinations in Malaysia e.g. transtar, 707 Express, Five Stars Express, Billion Stars so booking bus tickets used to involve either going down to People’s Park Complex where the offices for these bus services are located or calling them one by one to compare prices and timings. 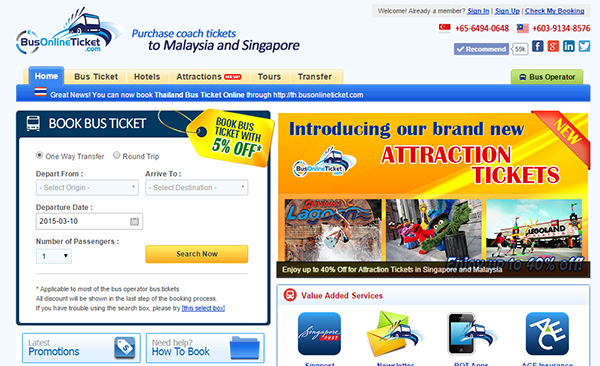 With BusOnlineTicket.com – a one stop portal for most Singapore-Malaysia route bus services, you can book your bus ticket online and compare prices, timings and even services offered onboard the buses e.g. whether meals will be served onboard, do you have your personal TV and whether free Wi-Fi is provided during the bus journey. The 3 most popular bus routes that BusOnlineTicket.com offers are those from Singapore to Genting Highlands, to Kuala Lumpur and to Malacca. This is not surprising since these destinations make for great weekend holidays since they are just 4-6 hours away by bus. Genting Highlands, as the name suggests is located on a mountain peak. It is just an hour drive from Kuala Lumpur; if you are travelling from Singapore by coach, it will take you around 4-6 hours to get to Genting Highlands depending on traffic. Also known as Resorts World Genting, Genting offers six hotels with 10,000 rooms, over 50 fun rides, 170 dining and shopping outlets, musical shows and performances and many other entertainment options. Average temperatures in Genting is around 15-25 °C so bring along a jacket/sweater. Genting Theme Park comprises the outdoor and indoor theme parks. The outdoor theme park is Genting Highland’s largest attraction, offering recreational activities with over 50 types of rides in a cooling environment. Indoor Theme Park in Genting is located in First World Plaza. You need to buy an all day pass to be able to ride the attractions there. Do note that the Genting Outdoor Theme Park is closed from 1 September 2013 for 3 years to make way for the world’s first Twentieth Century Fox Theme Park. Other rides and attractions located in First World Indoor Theme Park, SnowWorld, Sky Venture, Genting Bowl, Vision City and Funtasy World Video Games Park is still open. 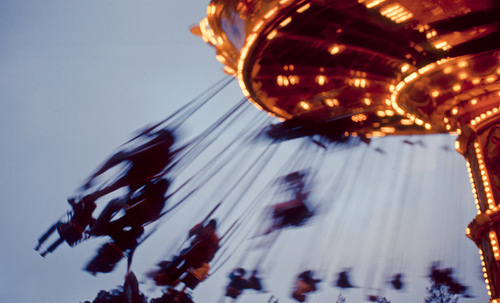 So you would not have the opportunity to take the Spinner at the outdoor theme park (as seen in the picture below). But there are other things to do at Genting – the Strawberry Farm at Genting is a place where the whole family can pluck strawberries and purchase them – you will be charged by the weight of the strawberries you plucked. Genting Skyway Cable Car Ride is one of the longest and fastest gondola lifts in Southeast Asia at 3.38km from the base station in Gohtong Jaya town all the way up to the peak. The First World Plaza is the best place you can go for shopping in Genting with more than 60 retail and 70 F&B outlets plus attractions. Kuala Lumpur, the capital of Malaysia, has plenty to offer in terms of famous landmarks, heritage buildings, shopping, vibrant night life and mouth-watering array of local foods. 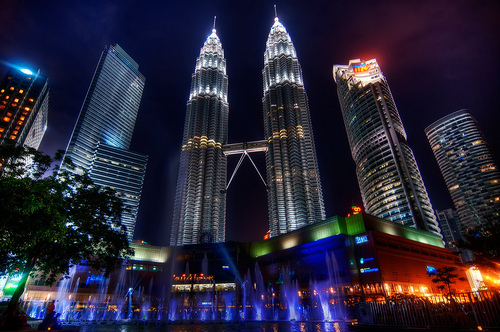 Famous landmarks in Kuala Lumpur that are popular with tourists include the Petronas Twin Tower. The Petronas Twin Tower used to be the tallest building in the world and the twin towers are connected at the 41 and 42 level by a Skybridge. Skybridge is opened to tourists for a bird’s-eye-view of the city. Besides the Skybridge, the KLCC shopping mall offers a luxury shopping experience and a few attractions such as the Petrosains Discovery Centre and the Malaysian Philharmonic Orchestra. Heritage buildings in KL that are worth visiting include the Jamek Mosque, the National Mosque, the Thean Hou Temple and the Sri Mahamariaman Temple. Do note there are strict dress code requirements as these are religious places. Kuala Lumpur is also a haven for shoppers. The Central Market at Jalan Tun Tan Cheng Lock and nearby Chinatown at Petaling Street are two bustling shopping places where you can find shops for variety of traditional handicraft items, textiles, clothes, shoes and handbags – you have to bargain hard though. The Kuala Lumpur Golden Triangle area offers upmarket shopping experience with malls like Pavilions, Lot 10, KL Plaza, Sungai Wang Plaza. You may also find the latest technology gadget at Low Yat Plaza. Do check out the local Kuala Lumpur hawker scenes too e.g. the Imbi Market food. The most popular day trip out of Kuala Lumpur is to go to the Batu Caves. It is within a short driving distance north of KL. The main cave could be accessed by climbing up 272 stairs. Hindu devotees perform annual pilgrimages during the festival of Thaipusam by putting on kavadis and climbing up these steps to the temple inside the main cave. You can even explore the caves with Dark Caves tour located right the caves itself. For Malacca – the two most popular activities are to take the Melaka River Cruise and walk along Jonker Walk over the weekends. During the 45-minute Melaka River Cruise ride, you will get to see the best bits of this historical city, offering sights such as the traditional Malay village Kampung Morten and the beautiful murals alongside Jonker Walk. Jonker Walk is definitely the place to go for experiencing the city’s heritage, and for excellent shopping, dining and nightlife experiences. 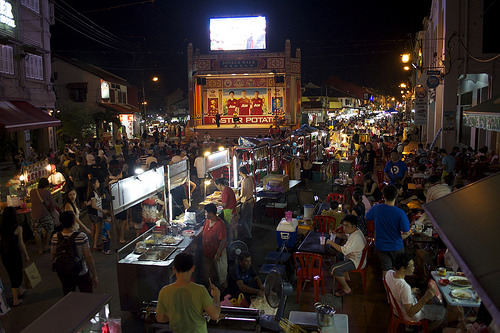 Jonker Street is lively and lined with museums (such as the Baba Nyonya Heritage Museum), souvenir shops, antique warehouses, and art galleries, together with a multitude of happening bars and specialty stores. I’m here to recommend Billion Stars Express. The best coach travel from Singapore to Penang. The price ticket is the cheapest in market worth with good service such as WiFi, plug for charger and comfortable seat. You can enjoyed surfing internet all the way to Penang and physically, mentally, emotional prepare your mind to enjoy the economic haven in Penang. Thank Billion Stars Express for providing me an enjoyable trip and services.